One of my nephews, Yutaro, is a musician. Last autumn, he wrote a lovely piece of music for me to go with my website. Since then, I’ve wanted to use his music in a special way and come up with an idea to create a short animation of a dogi performing Surya Namaskar A :). I am pleased to announce that the animation is finally up, thanks to Natsuko’s brilliant art work! To view the animation, please visit our website and click the button indicated on the top page. If you like the music, Yutaro has a page on MySpace. You’ll find more music there as well as information about his upcoming gigs. 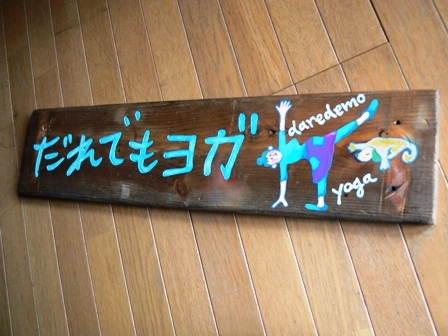 祝だれでもヨガの1周年記念 - happy 1st anniversary for daredemoyoga!!! Happy 1st Anniversary for daredemoyoga!!! We are celebrating our 1st anniversary this month. The concept of daredemoyoga, which began as a tiny seed planted in my mind almost 6 years ago, has sprouted and grown into a young sapling during these months. This has been only made possible by all my teachers, students, friends and family – without their guidance, dedication, support and love, daredemoyoga would have never happened. Anyway, in many aspects, I’ve had a truly amazing 12 months. One of these aspects I especially feel blessed about is that it has given me a great many opportunities to meet people. I have met so many lovely people since I opened the door to daredemoyoga. For some, yoga has become a part of their life and witnessing people discover the wonder of yoga has given me tremendous joy. I feel privileged to be a part of the community and through it I now begin to understand what yoga actually means to me – that yoga does not only unite the body, mind and soul, but more importantly it unites people together. I hope it will be the reality one day. Anyway, for a proper celebration, you’ve got to have a cake, right? 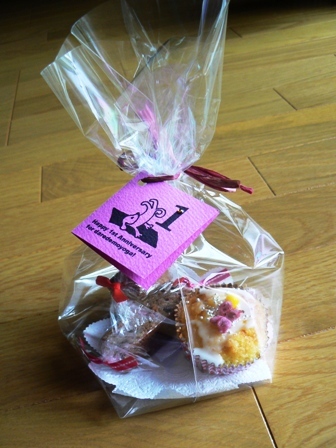 Thanks to my wonderful sister, we’ve got cakes! For a limited time only, we are giving away homemade cupcakes and brownies to everyone who attends a class at daredemoyoga. So, help us to celebrate our 1st anniversary and be a part of our community! Can you believe that in two months time, we have to say goodbye to 2009? The decade is almost over? But life never stands still, does it? Changes happen all the time. I have some fab news for you today about one of such changes! 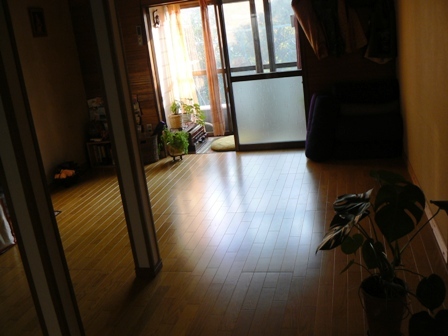 The long awaited renovation work to daredemoyoga has been completed just in time for our 1st anniversary. The studio space has been expanded and it now incorporates under floor heating. I’m confident that we can offer an even more comfortable and relaxing environment where you can enjoy your yoga practice. Well, at least we won’t freeze to death during Savasana in the coming winter. マスター・ドギ御用達Ｔシャツ - cool t-shirts fit for dogi masters! 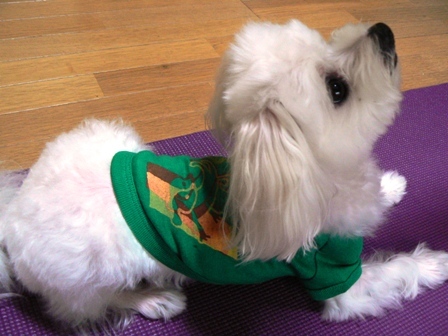 Cool T-shirts Fit for Dogi Masters! 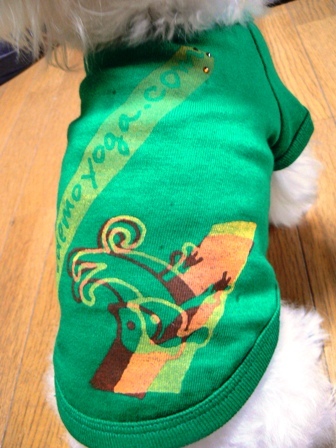 We now have fantastic T-shirts for the aspiring dogis as well as yogis. They are made of 100% cotton and come with a wide range of colours. Each T-shirt has an image of a dogi master in Sarvangasana hand printed on the back. Why don’t you have a matching T-shirt for you and your canine friend? This T-shirt will make your yoga lesson more fun. 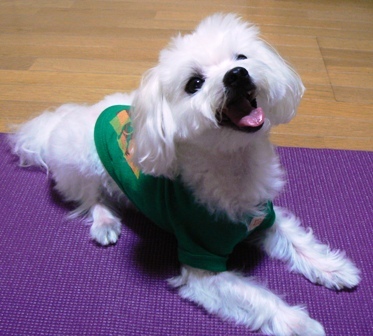 Also it will, no doubt, inspire your dogi master. Any enquiry, please email me via our website. 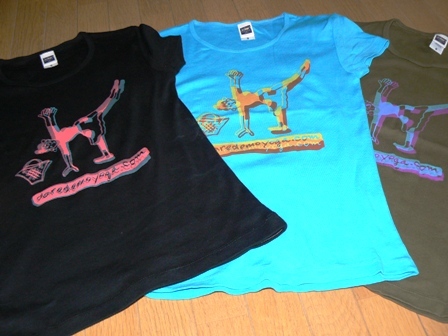 ファンキーオリジナルＴシャツ - funky original t-shirts for sale! Funky Original T-shirts for <?xml:namespace prefix = st1 ns = "urn:schemas-microsoft-com:office:smarttags" />Sale! Is it only me who thinks that the rainy season is dragging on and on? Anyhow, needless to say, I end up changing clothes throughout the day and cotton T-shirts are my most favourite item of clothing. 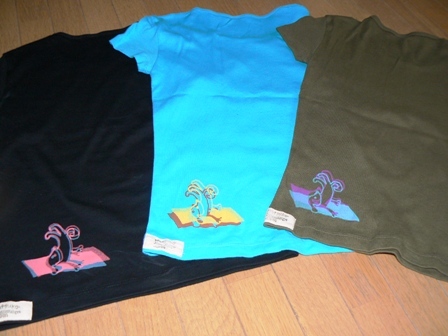 So unsurprisingly, I have been hatching an idea of making our original T-shirts for a long time. Funky, pop and cool T-shirts are now available! They are made of 100% cotton and very comfy. Whatsmore, each T-shirt is lovingly hand printed. 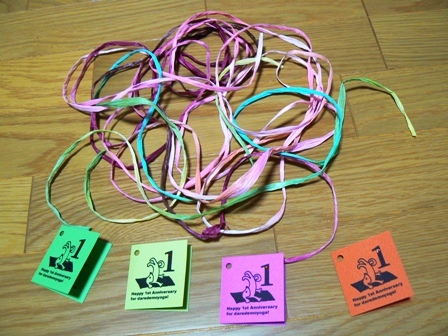 Hence each one is unique – slightly different from the others. Soon, a wide range of colours and sizes will be available.